This sets the stage for everything you need to know about James’s style– sharp around the edges with a cutesy flair. 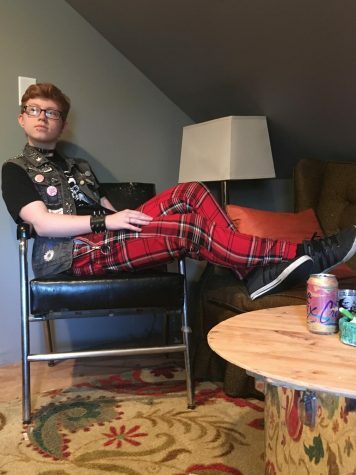 He’s often seen wearing mostly black, nine times out of ten with a punk rock band on his shirt and a heavy jacket, but that’s balanced out by accessories such as rainbow pony bead bracelets and brightly-colored glasses. and that to him, that means that you have to do your best to do good things and be “beautiful,” but also stand strong and firm in your beliefs, which springs from his punk rock background again. Punk rock is one of his biggest inspirations in all aspects of his life. According to James, style is about “having fun and not caring about what anyone thinks. Sometimes, you have to say to yourself, “well, if this person calls me a homophobic slur, so what? 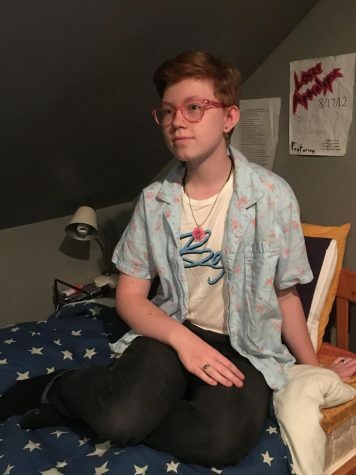 They’re not wrong, even if they are rude.’” Unfortunately, this is something he’s faced on the regular, both as a result of his sometimes-feminine style and his open LGBTQIA+ identity. “I love David Bowie. I love the 70’s rocker aesthetic, the drama, the androgyny, but I also love the new androgyny, the beauty of it all. I shuffle between a lot of aesthetics, but there’s always that idea there of the drama or flamboyance. I’m a little out there,” he said, and laughed. At the end of the day, though, it all comes back to having fun, looking cute, and loving rock and roll.